Just down stream from Ralph Stover State Park, Tohickon Creek tumbles over and around many large boulders, forming small pools and falls. The Tohickon’s clean, cool water helps many visitors to end up with at least their feet in the water. 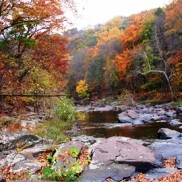 The cabins and campgrounds of this Bucks County park are a favorite during the water releases in late March and early November. For 2 days, water flows from Lake Nockamixon at a rate of 500 cubic feet/second, turning the quiet Tohickon Creek into a raging class 3 & 4 whitewater playground. Playground, picnicking, hiking, swimming, fishing, tents and cabins are featured.